The inaugural exhibition of 079 stories art gallery is a clarion to visit the new cultural space in the western part of Ahmedabad. Curated by Mumbai’s Tao Art Gallery, The Art of Storytelling presents 17 paintings, 7 sculptures & installations and one Video art, created by a group of 10 artists. 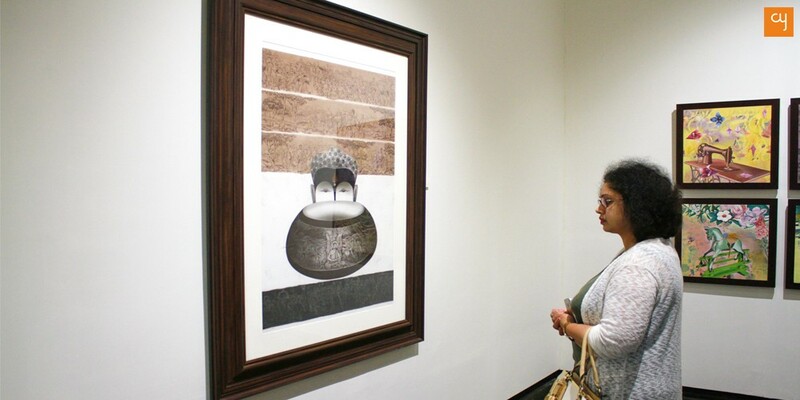 From Paresh Maity’s The Salt March to Jaideep Mehrotra’s Reflections in Mercury, each artwork on display, is a depiction of stories and narratives that has influenced the respective artist. The human body is a mix of fused complex compounds. But what is human consciousness made from? Are they made of real and surreal experiences, imagination or maybe, more significantly stories? Why did a pleasant bedtime story in childhood helped us to doze off with utmost serenity, while a horror account kept us awake all night holding a baseball bat in hand ready to strike on the hypothetical ghost? Stories play a significant role in building our thought process. It affects deeper then we assume, and further than we expect. The maiden exhibition at 079 Stories, perceptively titled ‘The Art of Storytelling’ is a cluster of narratives, brought to life through artists imagination. The ten participating artists, assume the role of a storyteller, to give us 25 eclectic works of art, each depicting a powerful narrative from their experience of life. ‘The Art of Storytelling’ show is curated by Sanjana Shah, the young heir of the illustrious Tao Art Gallery from Mumbai. She successfully achieved the arduous task of bringing together a wonderful mix of artists that ensures diversity of artistic expression. 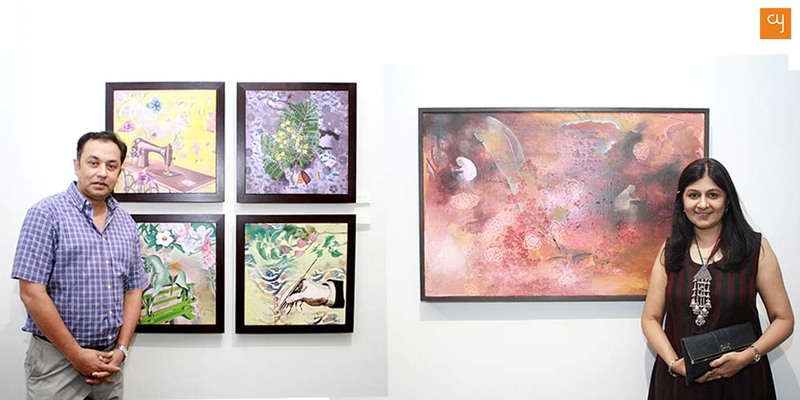 The show exhibits works from 10 artists – Arunanshu Chowdhury, Heeral Trivedi, Jaideep Mehrotra, Jayasri Burman, Kisalay Vora, Paresh Maity, Ratan Saha, Sachin Chaudhary, Sanjay Kumar and Vipul Prajapati. The showstopper, to say so, is the ‘Sound of Silence’, the magnum opus by Padma Shri Paresh Maity. Maity’s installation, all of 700 kgs and 12 ft height is an ode to sacredness of feminine beauty. Made from 4000 copper-alloy bells, the temple art style bust of a woman is kept open- to-air adjacent to the black-tiled amphitheatre of 079 stories. The other side of the amphitheatre is graced by Kisalay Vora’s contemporary installation art that is a display of a conceptual line. The freeform installation made of malleable metal fuses the linear structure with the available space poetically. He encourages the audience to cross these amorphous metal rods and walk through the sculpture. Vora, an alumnus of Sir JJ School of Arts, explained his thought process saying, “I have seen people looking at lines in the form of limitations. When an admirer crosses through my sculpted lines, he will realise that crossing something didn’t change the environment, nor it changed the air. 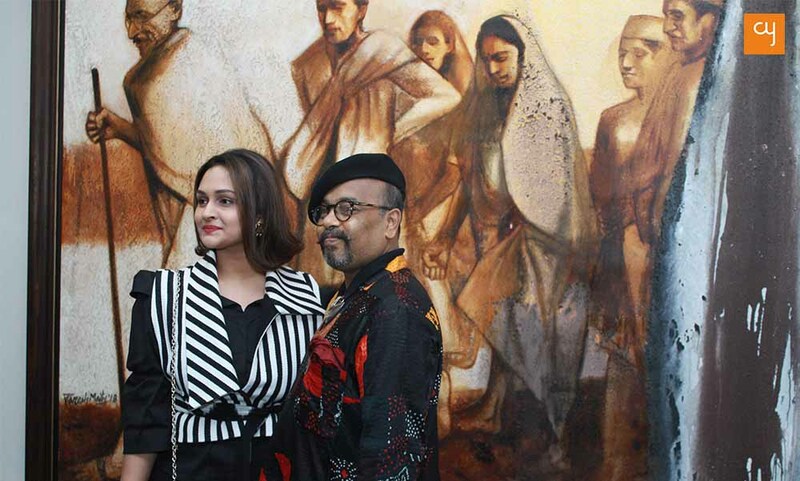 It’s only the mindset, which gets altered.” Vora has also showcased two of his paintings, in the main gallery, where he uses cotton threads and bullet pins to depict his play of lines. The paintings are deeply evocative and expresses the intricacies of human relationships in an engaging manner. The exhibition is divided into two sections – the main gallery, housed on the first floor showcases large scaled works while the boutique gallery on ground floor has on display smaller sized experimental works. The two installations that adorn the adjoining garden provide the perfect backdrop to the conversations that happen while one is at the show. As soon as you enter the main gallery, Maity’s The Salt March (77 x 113 inches) takes you by awe. The painting shows Mahatma Gandhi leading the famous Salt March in lovely hues of sepia. The gallery welcomes you with a ‘darshan’ of the ‘Sabarmati ke Sant’ and surprises you with strong visual imagery inspired from Indian mythology by Jayasri Burman. Through her depiction of ‘Kamalika’ Burman expresses a strong desire of unification and coherence, in an otherwise fragmented reality. The Delhi based artist who hails from West Bengal adds, “I want people to realise that women are as valuable as goddesses and the society ought to respect them”. As one turns around, leaving the captivating imagery of Burman’s ‘Kamalika’, one is greeted by the bright and nostalgic visuals by Arunanshu Chowdhury. Vadodara based Chowdhury, who is exhibiting has used elements like a rocking horse, sewing machine and a flowering branch of a tree to represent childhood memories in his art. His work is dreamy and creates a delightful imagery which is easy to the eye. Heeral Trivedi, on the other hand, uses the opportunity to depict visually, the stories that have been an influence in her life’s journey. She showcases two canvases inspired from Ernest Hemingway’s ‘The old man and the sea’ and a medieval European tragedy. A few steps further and Vipul Prajapati‘s realism inspired magnificent canvases made using graphite dust invite you. The Ahmedabad based artist, an alumnus of Sheth CN School of Fine Arts, through his work enquires the amusing nature of life by juxtaposing people playing football at a ship breaking yard, in front of an imposing but static ship. His other work at the show titled ‘Maternity’ urges the viewer to look deeper, before forming a perception. On the other wall, Patna based Sanjay Kumar displays his three Buddha inspired canvases. Kumar treads a different path in narrating the peace and serenity of Buddha. He consciously avoids the meditative pose of the enlightened one, and draws fresh forms of Buddha, with minute illustrations in background that depict episodes from HIS life. And there is still much more to consume. Ratan Saha’s bull sculptures made from bronze and fibreglass offer a metaphorical take on the uncertainties of life. Saha, through his work expresses the burdensome nature of ambition and material aspiration, he has shown this beautifully using the subject of ‘Sensex’ and the ‘raging bull’ of stock market. A word of mention is due for the display and arrangement of the artworks. Shah as a young curator has well justified each artwork by giving enough breathing space between the frames. The gallery’s wall, which do not have the customary niche required for hanging artworks, offers a more cleaner view of the works on display. Instead, Purva Damani, founder of 079 stories and her design team chose to use painted plywood as walls, which can be replaced or repainted, to offer greater flexibility for display. The other half of the gallery has a wall dedicated to a Digital Installation by Jaideep Mehrotra. Titled ‘Microcosm’ the video art depicts the ‘nothingness’ of ones being, when viewed against the limitless canvas of the universe. The audio-video installation at the gallery showcased his view on population explosion and how each is trying to create a space in this world, which is nothing but “a dot on a page”. However, what caught my attention more was Mehrotra’s fascinating artworks made using metal and mixed media. It’s fluidic nature, uninhibited choice of materials and the bold nature of liquid metal is deeply captivating. 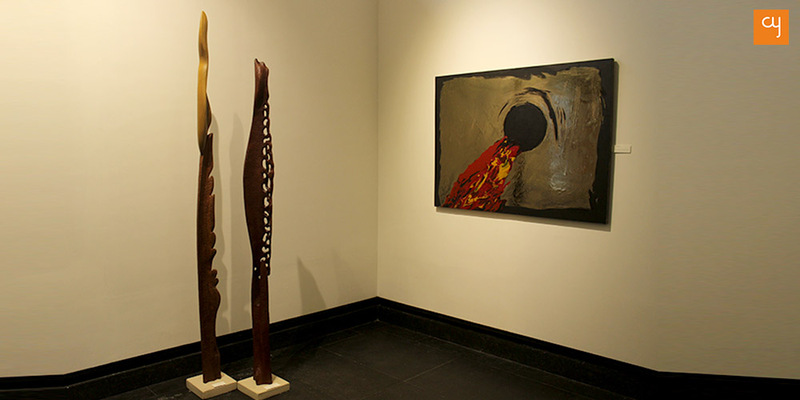 Towards the end of the gallery, are aptly placed unusual teak wood sculptures by Sachin Chaudhari. Mumbai based Chaudhari takes inspiration from nature, and lets these abstract forms evolve organically in his work. Though one is standing right on the threshold of the exit door, the sculptures have the capacity to arrest you with its view. The artist has expressed his childhood memories that are filled with fascination for forms of fish and claws of crabs. Chaudhari has been practising on this medium and technique since two decades, he finds a deep satisfaction in creating forms, that are devoid of a structure and yet contained within itself. I met a beaming Purva Damani at the show and she spiritedly said, “The plan is to make this premise an arts institution, where people can engage with creativity on a long-term basis. 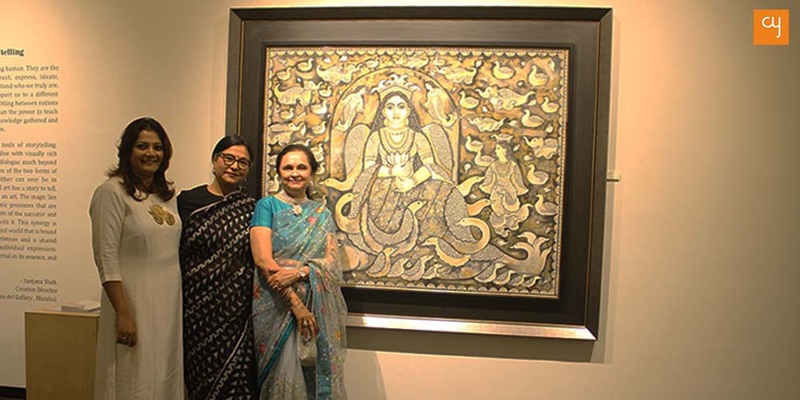 Hence the idea of having shows that run for long durations.” Present alongside, Kalpana Shah, founder of Tao Art Gallery, also emphasised the virtue of long-running exhibitions. Damani has invested nearly 3 years to make this place a reality. Knowing her vision, it seems Ahmedabad will have a lot to thank her for in the years to come. The inaugural day, October 23, 2018, witnessed a huge turnout of connoisseurs from all parts of the city. Jayshree Lalbhai, the patron of Kastulbhai Lalbhai Museum, Sonal Ambani of Samara Art Gallery, Artist Amit Ambalal and family, art entrepreneur Anil Relia, entrepreneur Arjun Handa of Claris Lifesciences, environmentalist Kartikeya Sarabhai, author-artist Esther David, Heritage entrepreneur Abhay Mangaldas, sculptor Nayana Soparkar, founder of Samvedana Trust Janki Vasant, media baron Shreyansh Shah were amongst the many influential’s who visited the opening night. 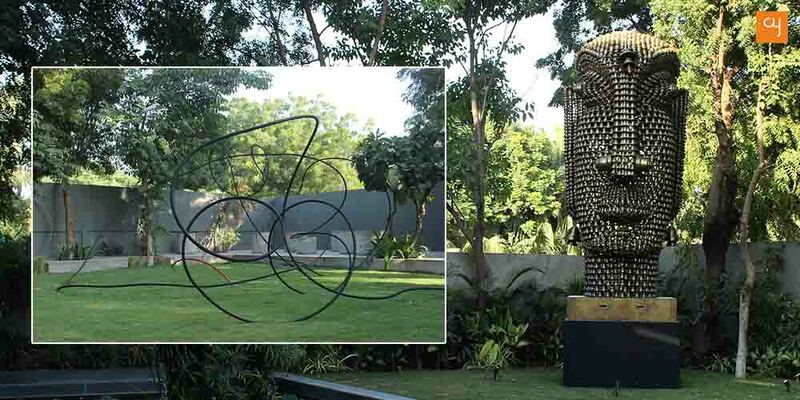 After Archer‘s new art gallery, this is the second new art space that has come up in Ahmedabad. The initial response of the citizens seems encouraging, to me as an appreciator of arts, these are signs of good times to come. The art adorers can visit ‘The Art of Storytelling‘ until November 20, 2018 every day between 11:00 am to 07:00 pm.